Ostara, also known as the Spring Equinox, is the magical season of fertility. Whether you are a solitary practitioner or belong to a coven, whether you are a beginner or seasoned witch, you may wish to celebrate this joyous season of life. You may know that Ostara falls between March 19th and March 22nd (in the Northern Hemisphere). It is not necessarily a one day celebration; you can celebrate all week long. We are finally emerging from the cold, dark winter into a season of new growth and fertility. Celebrate as if you've been waiting for an old friend to return from a long trip. Ostara is a time when life enters the world or returns from a deep sleep. You may find you have an extra hop in your step as the days grow longer and the sun gives us a burst of energy. You also may find yourself and those around you are in a better mood. The days may seem to go by more quickly even though they are actually longer. This time of new fertility brings with it better communication as your throat chakra expands and opens. This not only aids communication but also artistic expression and creativity. You may discover a passion for gardening, or become experimental in new things. Don't be afraid of these endeavors, just go with the flow. Here are ten ways to make the most of the Ostara seasonal energy. Winter often stagnates energy and transforms it into negativity. This manifests itself as depression for some, or you may feel down, chaotic or emotionally charged. Your body is a temple that has been hiding from the sun, protecting itself from the cold weather outside. You are about to shift your energy just as nature is transforming. Let go of that old energy and allow yourself to sprout new leaves and grow. In order to make room for the spring energy of abundance to flow in you need to cleanse and open new avenues within you. Embrace the return of the sun through cleansing so that you can welcome it with fresh intent. During the Winter we tend to eat warmer and heavier foods. When Spring returns it is time to eat fresher foods that are full of color. Start eating lighter meals made of from fresh, Spring fruits and vegetables. Gather your housemates, family member, or whoever is willing to hang out with you and clean. Invite them to participate in a fun and season-welcoming spring cleaning activity. Get rid of old furniture and things that are not useful, beautiful or joyful. Make food to snack on throughout the day. Have fun with it and embrace this time of life, excitement and joy. Push out the old to make room for the new. Spring is bountiful with beautiful seasonal fruits and vegetables. Create a picnic with friends and loved ones. Try to find a place by water to represent the flowing energy of life. Invite everyone to bring a dish that shows the vibrant colors of the season. It is not only a time for new beginnings, but for new friendship, adventures, atmospheres, and traditions. Eggs are a symbol of fertility because they produce life. Decorate eggs with natural dyes, such as turmeric or beet juice, decopage or paint. You can purchase plastic or wooden eggs to decorate and use year after year as well (a vegan option). Rabbits are another symbol due to the prolific way that they reproduce. Decorate your altar with these crafts. Gather with friends and family for togetherness, fertility and abundance. Have everyone set and share an intention. It's really important to come together during this time of new beginnings to bring positive energy and raise it together as one. You will find you have more laughter and joy in your heart when this is done with others. You can decorate with colorful ornaments, flowers, plants and candles. This can be done as a solitary activity or with others. Wake up before the sun on the first day of spring. As the sun rises welcome it by raising your hands up with palms to sky. This brings the sun into your body and aural field. Pull the energy of the sun through your Crown, Tjird Eye, Thraot, Heart, Solar Plexus, Sacral and Root chakras. Then, plant your hands firmly on ground to return the sun to Mother Earth. Take your time with this. Breathe in love, breath out gratitude. Smile. You will notice a difference in your own energy because the sun passed through you on it's way to the earth. Share your energy with those around you. This is another activity that can be done alone or with others. Collect flowers, flower petals, crystals and candles to create a flower mandala. Play music and burn incense in the background as you make patterns and spirals or whatever imagery you are drawn to. Put forth positive energy throughout your creation process. When you finish sit in meditation with the mandala and the energy you created. By yourself or with friends and loved ones decorate an altar for spring. Use bright colors and vibrant imagery. Make sure it's somewhere you can visit easily and often. If you are nervous that those you live with will judge you or be fearful of the witchy symbology, keeping it positive and light by using only flowers and candles. You do not want to invite fear into your home and certainly not to your altar. If those who live in your home understand the symbolism, then add in pentacles, goddesses, symbols of protection and blessings. Placing living plants and flowers can encourage you to visit daily. Make it a beautiful, colorful, celebration of life and new beginnings. Imagine you are throwing a baby shower for mother nature. Spring awakens new life so celebrate it with new life. Take yourself to the zoo, a farm or petting zoo, where you might find baby goats, chicks, ducklings, calfs, etc. Spend time with the small creatures and gaze into their beautiful, big eyes. Additionally, if there are new babies in your family, spend time with them. Take a picnic, a walk or do whatever you are drawn to. Babies only know love so share that positive energy with them. Assist the Homeless - temporary shelters that house people during the bitter cold months of winter often close around Ostara. Pickup Garbage - when the snow melts, it reveals months of litter. Looking for more? You can find some recipes and crafts on the Mumbles & Things Tumblr. My top ten choices of stones that can be helpful dealing with the many emotions and themes of this season would be Tigers Eye, Tree Agate, Serpentine, Peridot, Sunstone, Amethyst, Green Aventurine, Amazonite, Sodalite, Obsidian. Continue your journey on the Mumbles & Things Facebook page. Follow my Ostara board on Pinterest for more ideas! 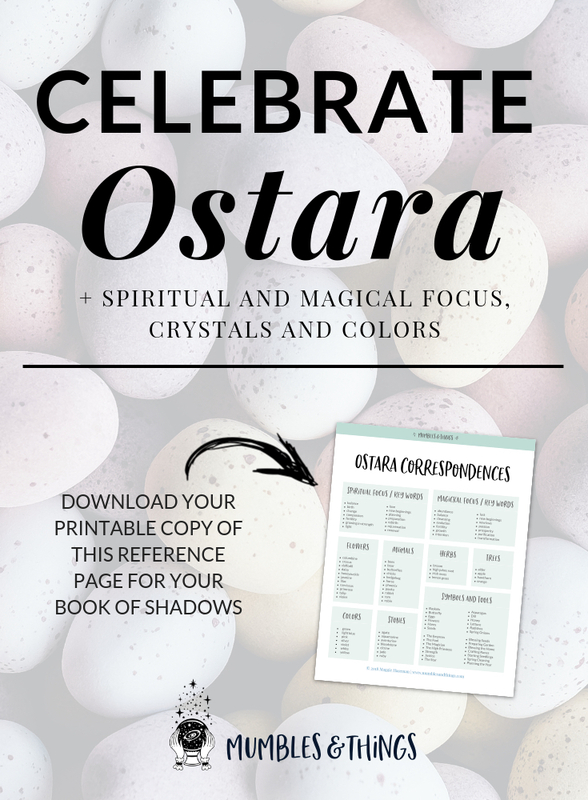 What are some of your Ostara traditons? Tell me about them in the comments below.